Follow-up question: for the JFET, which is already ön" with zero voltage applied to the gate, describe what would be necessary to force it into the öff" state. 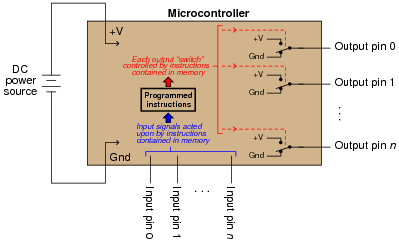 It is very important for students to understand what conditions are necessary to drive any of these transistor types into their ön" states, as a precursor to understanding their function in linear (analog) circuitry. 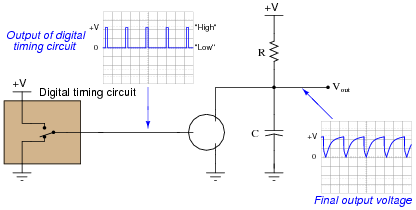 Explain how this revised circuit works. When does the MOSFET conduct current, when the point contacts are open or closed? How does this compare to the working of the previous (BJT) circuit? What purpose does the 10 kW resistor serve? 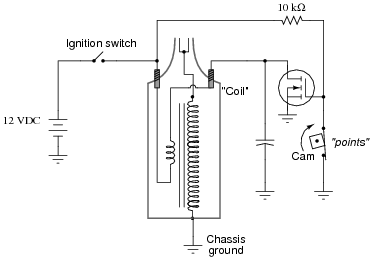 The MOSFET conducts current when the point contacts are open, which is opposite that of the BJT. I'll let you figure out what the purpose of the resistor is! 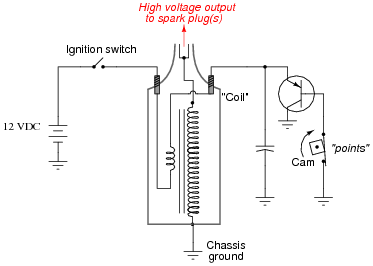 If this were a real ignition system, the timing would have to be adjusted, as the spark will now be produced every time the points close rather than every time the points open as it did before (with the BJT). Discuss the operation of this circuit with your students, asking them to explain how they know the MOSFET's status (and the BJT's status, for that matter).